Ghalia Benali grew up in an artistic family in the south of Tunisia. From her childhood on she was impregnated with different kinds of music and poetry: French chansons, Egyptians and Indian musicals, melodies from Syria and Iraq, the "tartil", the sung lectures of Koran, and the poetry of Om Kalthoum. Ghalia sings with an incredible expression, and a strong sensuality with a voice that sticks to your skin. Besids singing, Ghalia is also a dancer, actress and artist in plastic arts. In 2000, she recorded her first CD "Wild Harissa" with the group Timnaa for German record label Network, followed by "Romeo & Leila", "Al Palna" with Belgian sitar player Bert Cornelis, and "Ghalia sings Om Kalthoum" in 2010. As an actress, she played the role of Meriem in "La saison des hommes" by Tunisian Director Mouffida Tlatli in 1999. In 2001, she played the role of a dancer in the film "Swing" by Tony Gatliff. 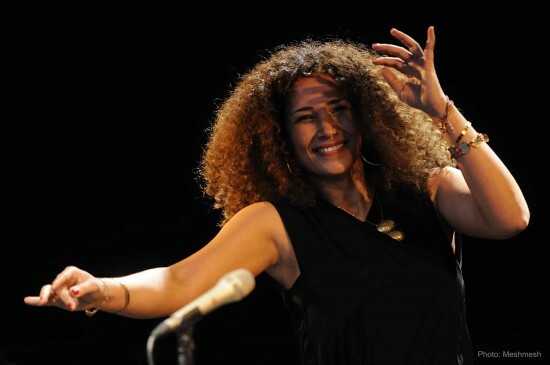 The Tunisian artist Ghalia Benali needs no further introduction in the European and Arab music scene throughout the world. In recent years and with different projects she performed on many international stages, galvanizing diverse audiences with her voice, dance and impressive stage presence. Her latest project is called MwSOUL, meaning "connection". Inspired by several events that touched the Arab world, Benali felt the urge to create and communicate. "I was singing what the people were writing. I’m living in Belgium, they’re living in Egypt, Tunisia, Palestine, Syria and, truly, we communicate. “Connection” is the concept. "Al-Wassel", therefore connection. In Classical Literary Arabic, we say: "Mawssouline", "Al-Wassel ", "Wassel ", it's about being linked, connected to something. Over there, they are told: stay connected. Stay "Mawssouline…"
MwSOUL might be Benali’s most Soufi and spiritually orientated project so far. The repertoire was written by her and arranged by jazz collective Mâäk. Some of the lyrics are written by young Arab poets, others by herself. The breath and the rhythm are the basic driving forces throughout the whole project, both for the voice as for the wind instruments. The pulse is naturally provided by oud, drums & percussions. MwSOUL is rooted in soul, breaths life and exhales energy. It is about the silent yet ever present connection between two creating beings, between past and future, between death and life. MwSOUL will release a first album in spring 2017 on the label ‘De Werf Records’.